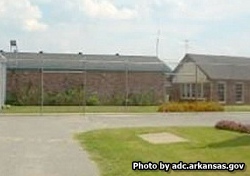 Wrightsville Unit is located in Pulaski County Arkansas. The facility houses up to 950 medium to minimum security inmates. This facility does not have an actual physical address but if you take Interstate 530 to exit 7 and go east to highway 365 you will see signs for the institution. Inmates at Wrightsville Unit have access to educational programs such as earning their GED, and substance abuse treatment. Inmates can also work with animals from horses to dogs. Agricultural and regional maintenance work opportunities exist for inmates incarcerated here. This facility even has a program where inmates can learn Braille and prepare for their eventual release. Visitation for inmates with the last name A-L is on Saturdays. Visiting for inmates with last name M-Z is on Sundays. Class 1 may have visitors on either day. Both days have visitation from 12pm-4pm but many people arrive early around 11:30am and sometimes they make you start to leave by 3:45pm. You should still contact the inmate to verify the visiting hours as this facility sometimes rotates the visiting schedule.